WASHINGTON (AP) — The Pentagon said Wednesday it was deploying a missile defense shield to Guam to protect the U.S. and its allies in the region in response to increasingly hostile rhetoric from North Korea. The North renewed its threat to launch a nuclear attack on the United States. The threat issued by the General Staff of the Korean People’s Army capped a week of psychological warfare and military muscle moves by both sides that have rattled the region. On Wednesday, the Pentagon announced it will deploy a land-based, high-altitude missile defense system to Guam to strengthen the Asia-Pacific region’s protections against a possible attack. Pyongyang, for its part, said that America’s ever-escalating hostile policy toward North Korea “will be smashed” by the North’s nuclear strike and the “merciless operation” of its armed forces. “The U.S. had better ponder over the prevailing grave situation,” said the translated statement, which was issued before the Pentagon an­nounced plans to send a missile defense shield to Guam. The Pentagon had no immediate reaction to the latest statement, but earlier Wednesday Defense Secretary Chuck Hagel labeled North Korea’s rhetoric as a real, clear danger and threat to the U.S. and its Asia-Pacific allies. And he said the U.S. is doing all it can to defuse the situation, echoing comments a day earlier by Secretary of State John Kerry. “Some of the actions they’ve taken over the last few weeks present a real and clear danger and threat to the interests, certainly of our allies, starting with South Korea and Japan and also the threats that the North Koreans have leveled directly at the United States regarding our base in Guam, threatened Hawaii, threatened the West Coast of the United States,” Hagel said. Deployment of the Terminal High Altitude Area Defense System is the latest step the U.S. has taken to bolster forces in the region in a far-reaching show of force aimed at countering the North Korean threat. In recent months, North Korea has taken a series of actions Washing­ton deemed provocative, including an underground nuclear test in February and a rocket launch in December that put a satellite into space and demonstrated mastery of some of the technologies needed to produce a long-range nuclear missile. Then, several weeks ago, the North threatened to pre-emptively attack the U.S. In response, the Pentagon an­nounced it would enhance missile defenses based on the U.S. West Coast, and it highlighted the deployment of B-52 and B-2 bombers, as well as two F-22 stealth fighters, to South Korea as part of an annual military exercise. As the exchange of rhetoric grew, U.S. officials this week said the Navy would keep the USS Decatur, a destroyer armed with missile defense systems, near the Korean peninsula for an unspecified period of time. Another destroyer, the USS John S. McCain, was shifted to the waters off the southwest coast of the Korean peninsula. Tensions have flared many times in the six decades since a truce halted the 1950-53 Korean War, but the stakes are higher now that a defiant North Korea appears to have moved closer to building a nuclear bomb that could not only threaten the South and other U.S. allies in Asia but possibly, one day, even reach U.S. territory. Even without nuclear arms, the communist North poses enough artillery within range of Seoul to devastate large parts of the capital before U.S. and South Korea could fully respond. The U.S. has about 28,500 troops in the South, and it could call on an array of air, ground and naval forces to reinforce the peninsula from elsewhere in Asia and the Pacific. U.S. officials have said that the Pentagon’s military response to Pyongyang’s threats has so far been aimed more at assuring South Korea and other allies in the region that America is committed to their security. U.S. military leaders also have said that despite the escalating rhetoric, they have seen nothing to suggest that North Korea is making any military moves to back up its threats. 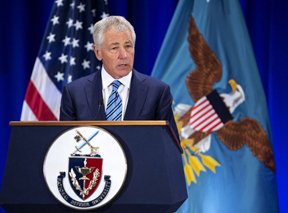 Hagel told an audience at the National Defense University that there is a path to peace on the troubled Korean peninsula, but it doesn't include making nuclear threats or taking provocative actions. The land-based THAAD missile defense system includes a truck-mounted launcher, tracking radar, interceptor missiles, and an integrated fire control system. The Pentagon said the system will boost defenses for American citizens in Guam, a U.S. territory, and U.S. forces stationed there.